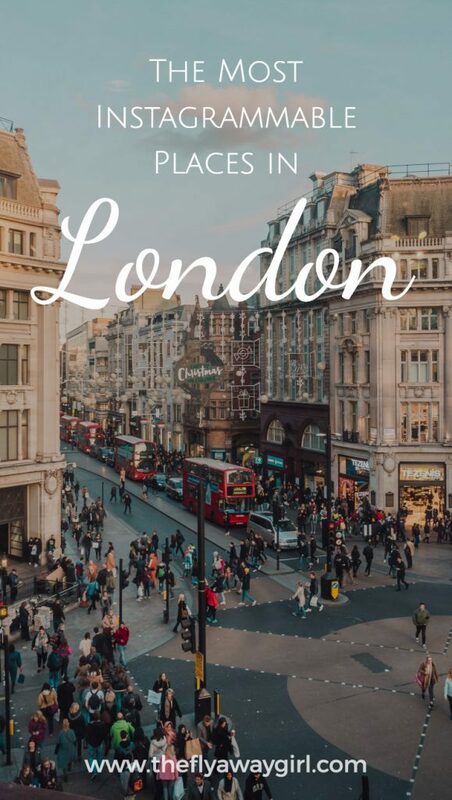 London is truly an Instagrammer’s dream destination – instagrammable cafés, insta-worthy facades and colourful houses decorate the feeds of London-based influencers and travel bloggers visiting the British capital. Rain or shine (and, let’s face it, it’s usually raining), the city can inspire any photographer. Here are some of the most instagrammable places in London for getting that shot for the ‘gram! Want to read my post on the go? Download my free eBook on the most instagrammable spots in London to read on Kindle, smartphone or other eReader! Don’t forget to book a hotel or an Airbnb in London – click here for £25 off your first Airbnb booking! Don’t book in GBP? Click here for a €28 discount or $32 discount instead. Peggy Porschen is the spot for millennial pink and cupcakes. Who could say no? On a normal day, you will probably spend about half an hour waiting for others to take their photos before you can get one without everyone else in… You have been warned! The combination of cute cupcakes, pretty coffees and millennial pink decor seems to be a winning strategy for success in London – but are the cakes too cute to eat? …nope. They’re pretty tasty too! They even have some vegan cakes on offer as well as their decor changes depending on the season. Want to edit your photos like a pro? My new Lightroom preset pack was designed around UK locations, including areas in London including Notting Hill! There’s just something about quaint London mews… Also, if you were wondering (I was), mews are a row of houses or flats that were converted from stables and are usually built around a courtyard. You probably didn’t care, but London has 433 authentic Mews properties still in existence. I do not know, however, what a single ‘mew’ constitutes. Warren Mews is located near Regent’s Park and has a beautiful entryway to the mews themselves. If you’re lucky, someone might have parked their pink bicycle outside as well. What a shot. The closest tube station is Great Portland Street. One of London’s best-known spots for autumn, you can scroll through the location tag on Instagram and watch the change in seasons through other people’s photos. Tip: check the ‘most recent’ photos before you go to see if the leaves are still there! Kynance Mews is also popular in spring as the wisteria blooms on the facades of the homes in the mews. 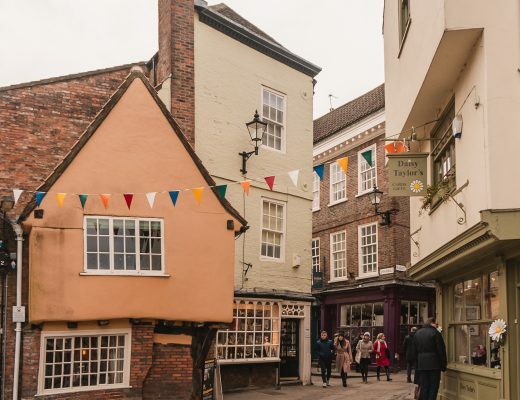 Most people only visit one side of the mews – don’t forget to cross the road and check out the other half, it might not be as much of an insta hotspot but it’s still super pretty! The closest tube station is Gloucester Road. 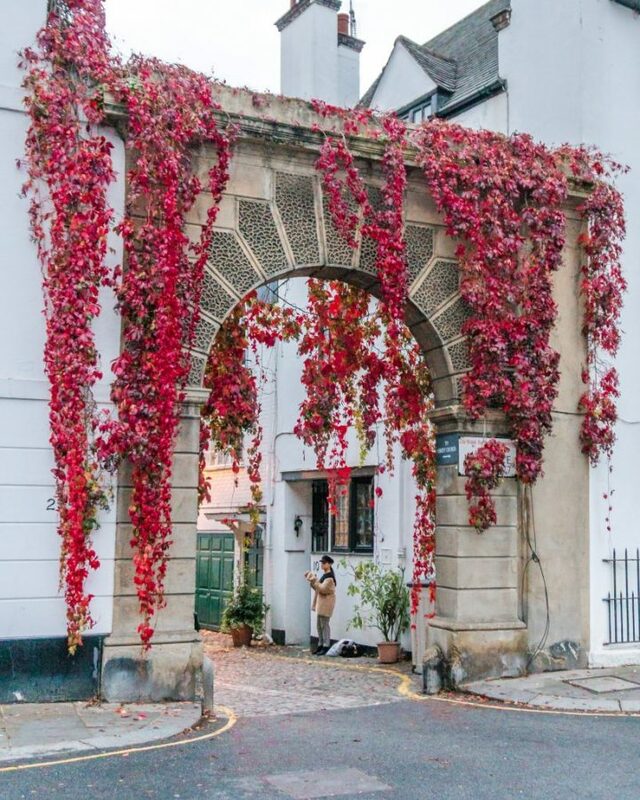 Read more about the most instagrammable places in London in autumn! I mean, this is obviously not its actual name, but it’s pretty fitting. Also known as the ‘fringe door’ (that may or may not need a haircut). 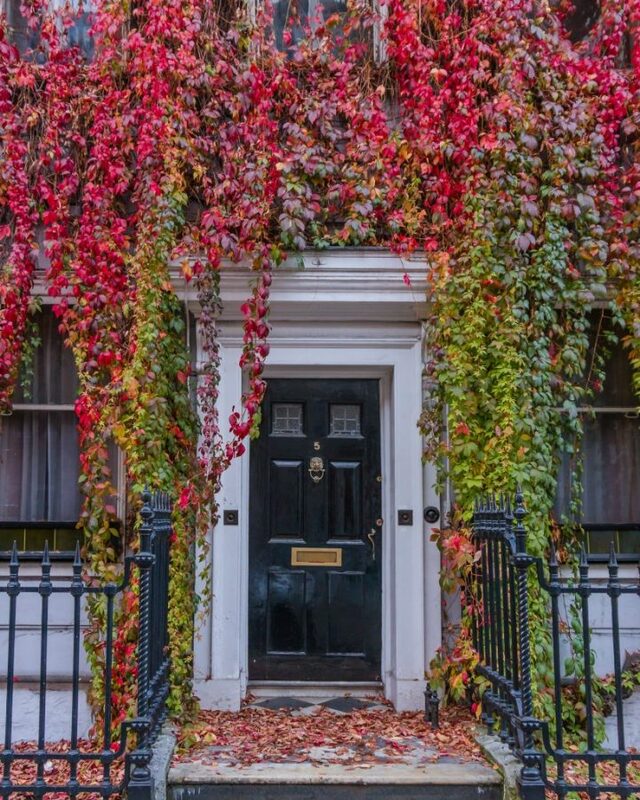 This gorgeous autumn spot is located on Wimpole Street, just off of Wigmore Street. Most people don’t tag the location, though, and rather call it ‘Marylebone’, ‘Mayfair’ or the even vaguer ‘London’. Thanks, guys. This door is also gorgeous in springtime as, instead of a fiery red, it becomes a beautiful shade of purple when the wisteria blooms. You can also visit other spots nearby, such as St Christopher’s Place, Feya and Sourced Market. Possibly the most instagrammed pub in London (and the UK!). You can see why, though! Definitely one of the best places to take pictures in London, especially on a sunny day! I actually remember going to this pub a long time before it became an Instagram icon (i.e. about 10 years ago) – apparently it was the first pub in London to serve Thai food and that food is why I remember it so well! (Seriously, it was delicious). Also, did you know that they spend £25,000 on flowers every year? So if you’re grabbing that Instagram shot, maybe pop in to have a swift pint (alcoholic or not) to say thanks for brightening up the streets with their floral displays. PS: At Christmas, the pub changes its entire exterior decor. Instead of flowers, the pub is covered with 90 Christmas trees and 11,500 lights. It costs £5,000 to put together! Check out Christie’s round up on the 8 Things Not To Miss In London – including Notting Hill and The Churchill Arms! Neal’s Yard is a little alley in Covent Garden with colourful storefronts, lots of foliage, and a bunch of stores and cafés to amuse yourself for an afternoon. And yes, Neal’s Yard Remedies did begin here (in 1981!). One of the most aesthetic places in London? I think so! This (not-so-secret) location in London is still a bit of a hidden gem and a spot of green solitude in the busy city. Well, aside from all the Instagrammers, anyway. There’s also a great coffee shop in the courtyard called Jacob The Angel, so grab a cup of joe and sit down and relax for a few minutes. Notting Hill, most notably Portobello Road, is a great spot for photographing colourful terraces. Aren’t they so cute?! My favourite road in Notting Hill for Instagram shots is probably Denbigh Terrace, it’s actually not usually too busy but there are so many cute and colourful houses on that street that you’ll definitely get a great shot. Nearby you can also visit popular spots such as Wild At Heart florist, Portobello Road Market and The Hummingbird Bakery. 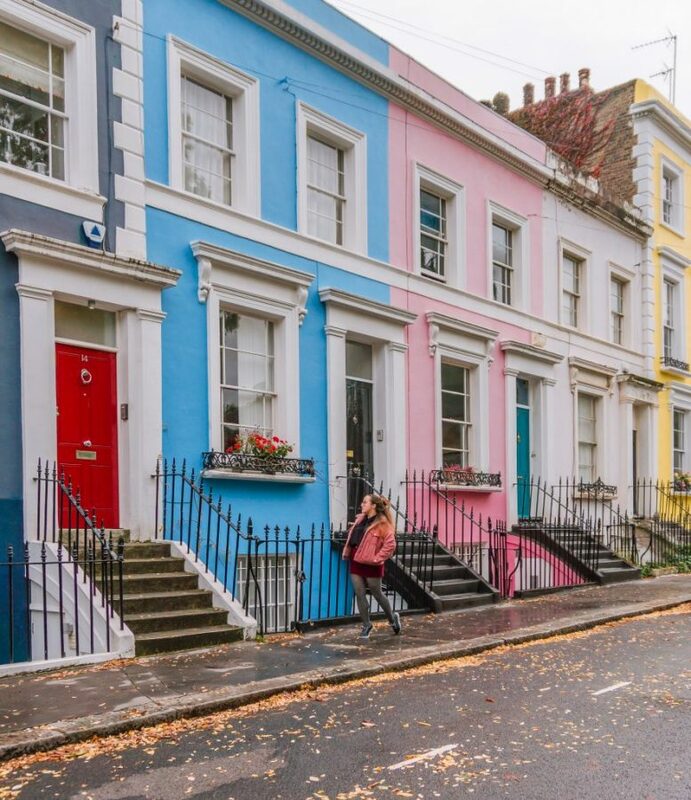 Chelsea, also in the Royal Borough of Kensington and Chelsea (just like Notting Hill), also has rows of colourful houses but is generally less visited by tourists – perfect for getting your shot without other people in! One of the prettiest streets in Chelsea is Bywater Street, not far from Sloane Square underground station. Also, a fun fact is that 9 Bywater Street was chosen by author John Le Carré as the home of fictional spy George Smiley. This actual address was used when they filmed the 1979 BBC series of Tinker Tailor Soldier Spy! 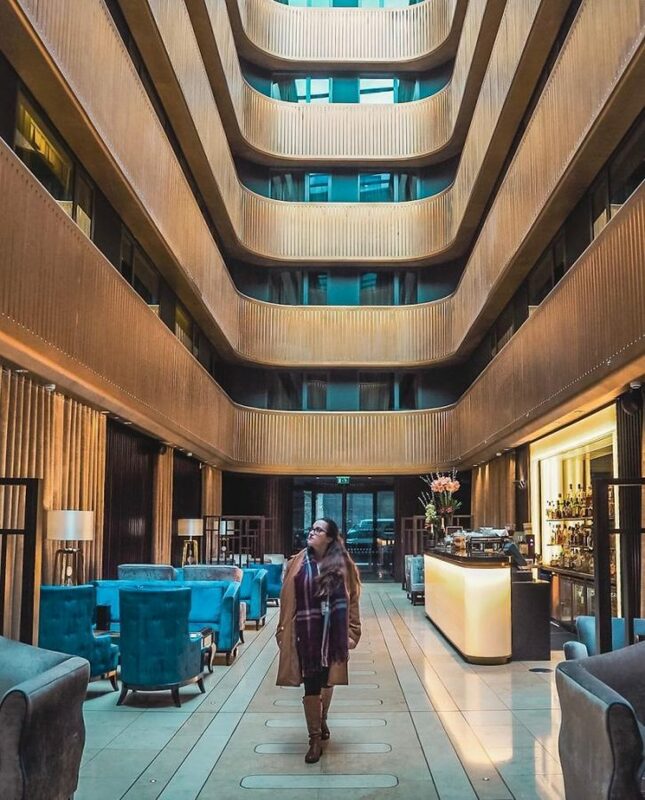 The Dorsett Hotel in Shepherd’s Bush is housed in a former cinema, making the interior ultra instagrammable! The atrium is a true work of art, as are all the rooms. Elegant decor really makes this hotel! Dorsett also has another hotel in London, Dorsett City located on Aldgate High Street. This hotel offers amazing views over the centre of London and is located only an 8-minute walk from the beautiful Leadenhall Market. Book a stay at the Dorsett Hotel from £99 for a double room. Disclaimer: I was kindly hosted by the Dorsett during my stay in London. All opinions are, as always, my own! 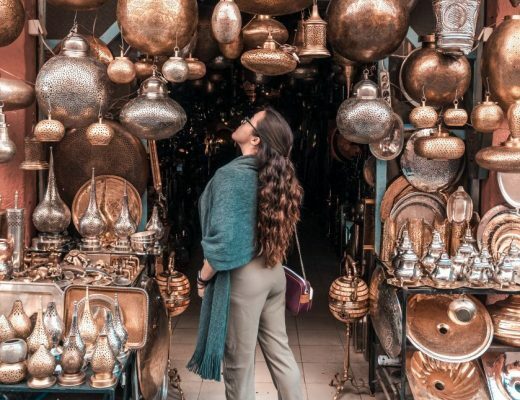 This instagrammable market is home to shops, restaurants and various food stalls and offers a whole host of photo opportunities as well. It is one of the oldest markets in London and was even part of the marathon course during the 2012 Olympic Games in London, where runners passed through the market from Whittington Avenue to Lime Street. Not just an ultra instagrammable spot in London, but also a great restaurant! Plus their outdoor area has heating, so it’s the perfect spot to enjoy a mulled wine on a winter evening. Possibly one of the most instagrammable restaurants in London, especially around Christmas time. Their decor changes depending on the season so during autumn they have lots of autumn leaves decorating the outdoor area and in winter they decorated with ferns and winter florals. Definitely one of the best Instagram spots in London! Who doesn’t love a good bookshop? The main branch is in a former Edwardian bookshop and they specialise in travel books too (erm, yes please)! In my opinion, this is definitely one of the most instagram worthy places in London. Daunt Books is actually a chain of bookshops in the city and was founded by John Daunt. The first branch in Marylebone, built in 1912, claims to be the first custom-built bookshop in the world! Daunt Books arranges its sections geographically, with guides, phrasebooks, history, fiction, and travel writing all organised by the relevant country. A great activity in London on a rainy day or when you want a bit of travel inspiration! I added this hotel just because of their staircase. I mean, the hotel overall is stunning but their staircase really takes the biscuit! Book a stay at the beautiful St. Pancras Renaissance and take aaaaaaaaaall of the photos! A great place to take photos in London for sure. The hotel is part of St Pancras International Railway Station, and the hotel occupies an 1873 Gothic Revival building. St Pancras Renaissance Hotel now occupies most of the former Midland Grand Hotel, which was there from 1873 and closed in 1935. After the closing of the Midland Grand, the building was used for railway offices until 1980 when it was closed for significant refurbishment after failing fire safety regulations. The development began in 2004 and St Pancras Renaissance was opened in 2011 with the Grand Opening on May 5th, 138 years to the day after the opening of the Midland Grand Hotel. Come for the brightly coloured coffee, stay for the delicious food! This Wandsworth Antipodean-style cafe offers dishes such as smashed avocado and feta with chilli, lime and a poached egg on sourdough and pineapple bircher muesli. A luxury biscuit boutique café. Need I say more? Ok, fine. Biscuiteers Baking Company was started in 2007 by a husband and wife team and originally was online only, offering hand-iced biscuits, chocolates and cakes. They opened their Notting Hill cafe, Biscuiteers Boutique & Icing Cafe, in 2012 and opened a second cafe in Battersea in 2014. The cafe is well known for its beautiful black and white facade, as well as the elegantly iced biscuits on display. They make for great gifts to take back home! It should not surprise you in the slightest that this (highly instagrammable) café is in Notting Hill. They have some intriguing coffees (including a rose latte and a charcoal latte), and the pancakes are seriously recommended. They are SO GOOD. However, expect to queue! After all, it is one of the most instagrammable cafes in London. However, if you really don’t want to queue, try coming after 3pm to avoid the lunch rush. Coffee, cinnamon buns and an instagrammable exterior. Mmhmm. The Monocle Cafe offers delicious lunch options like a chicken katsu sandwich, an avocado and gravlax sandwich, sourdough grilled cheese with apple and Goma Udon. They also offer Swedish cinnamon buns and delicious coffee from Allpress Espresso. The cafe is run by the magazine, Monocle. This pink gem is an Instagram highlight (with cafes in Mayfair, Knightsbridge, and two new stores off Oxford Street) and has a delightful menu with vegan breakfasts, Middle Eastern-inspired lunches and their delicious Spanish latte (not to forget their ruby latte – pink of course!). Aside from just being delicious, it’s certainly one of the best places to take photos in London – food photos that is! 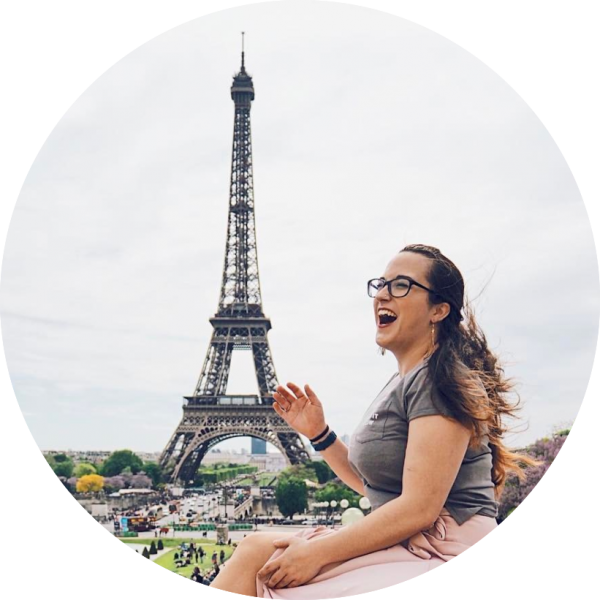 The cafes all have beautiful interiors and have become a hotspot for Instagram photos – expect a large queue at peak times! The most recent Elan Cafe opening was their one on Hans Crescent in Knightsbridge, most recognisable for its bright coffee-related signs on the walls such as ‘All you need is love and coffee‘. Cute. I mean, you can’t go to London and not go to St. Paul’s! This is one of my favourite angles to photograph the cathedral – 1 New Change is the address you need. This is seriously one of the prettiest places in London for me. The inside of St Paul’s is also really impressive so I definitely recommend a visit if you have the time! I haven’t actually been up the Shard (yet), but even without going up you can still get some great shots of London’s newest landmark, rather than from it. Also, writing this article meant that I learned The Shard is the tallest building in the European Union until the UK leaves – who knew?! You can visit the bridge completely for free, but if you want to go up the Towers then you should do the Tower Bridge Exhibition, a tour of the towers including the history of the bridge and Victorian London. Head to the Natural History Museum for a beautiful winter scene, ice rink and all! In winter this is one of the most beautiful places in London. The museum is a great spot to visit all year round and has completely free entry, although donations are appreciated! Some temporary exhibitions have entry fees, such as Wildlife Photographer of the Year. The museum also occasionally hosts plays, such as the current one called ‘The Wider Earth’ about a young Charles Darwin. Another of London’s best festive spots – the ice rink (and Christmas tree) at Somerset House. Somerset House itself is a grand Neoclassical building just east of Waterloo Bridge. It was built on the site of a Tudor palace belonging to the Duke of Somerset and the East Wing is now part of the campus of King’s College London. Construction on this beautiful Georgian building started all the way back in 1776 and, even though the Duke of Somerset was overthrown and executed in 1552, the building still bears the name Somerset House. 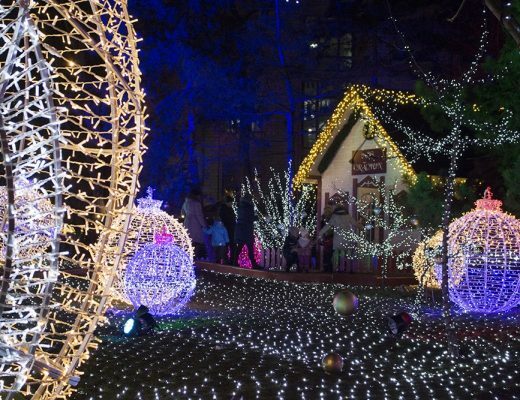 A hotspot for those in need of retail therapy, plus some super pretty Christmas lights. 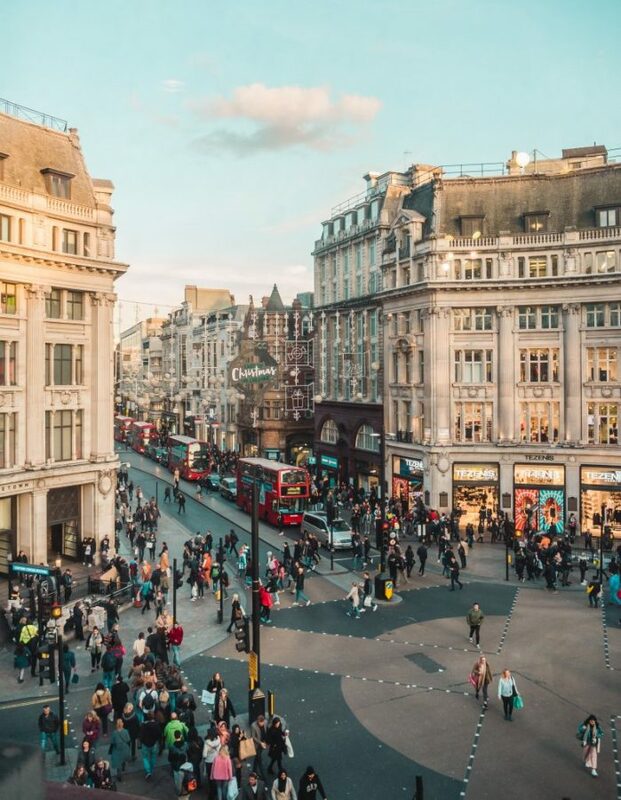 Oxford Street is Europe’s busiest shopping street, with around half a million visitors each day! My favourite viewpoints for photographs of Oxford Street are in H&M or Urban Outfitters at Oxford Circus. Regent’s Street, which runs perpendicular to Oxford Street, also had some beautiful angel lights in Christmas 2018 which really lit up this shopping centre of the capital. Definitely one of the most instagrammable places in London this Christmas! Home to the well-known Covent Garden Market (and also often known as ‘Convent Garden’ by me since I can’t type)*, Covent Garden gets all decked out for the festive season. Pop by the beautiful Petersham Nurseries store before you head to Neal’s Yard! Covent Garden itself is always a beautiful area but it really goes all out at Christmas! With a large Christmas tree, huge light decorations (this year there was a giant reindeer) and a really pretty festive installation at one entrance (which was basically designed FOR photos), they really know how to do the festive season here! The market used to be a fruit and vegetable market, which dates all the way back to 1654! In the 18th century it became a fairly well known red light district… but in 1830 Parliament decided they wanted to ‘freshen up’ the area and the covered market was built. The current shopping centre in the central market building dates back to 1980 and has a craft market called the Apple Market. Covent Garden is also home to the world’s largest Apple store (funnily enough of zero relevance to the Apple Market, confusing I know). *it turns out the name ‘Covent Garden’ actually came from the 13th-century name of ‘the garden of the Abbey and Convent’ so technically my typos are the correct name, just from 800 years ago. Call me vintage. I am sure there are many other amazing and photogenic places in London that I missed in this article – there are so many! For me, these are certainly some of the most instagrammable places in London and the best bit is that most of them are free as well. Plus you can just wander around most of the boroughs and find a cute café or an instagrammable facade, which is what I love to do when I have a spare hour in the city. I always discover some awesome new places! 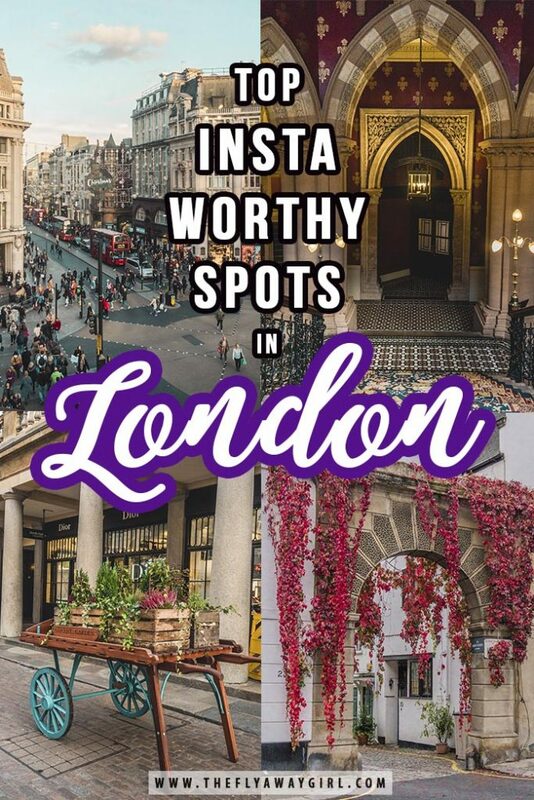 Do you have any top Instagram spots in London? Let me know in the comments! Did you enjoy this article? Don’t forget to pin it!